Like millions of people, I have gone on my share of weight-loss diets. I have fasted, eaten only grapefruit for a week, followed juice diets, Weight Watchers, low-calorie and macrobiotic diets, and the Atkins diet (more about that later). Also, like many people, I seesawed. I would lose weight while on the diet, then gain it back shortly afterwards. I soon discovered that "dieting" per se for weight loss is generally a lose-gain situation (lose weight now, gain it back later). I found that the best way to keep off unwanted pounds is to choose a dietary lifestyle based on sound health principles. While I think I have finally made the right dietary choices, it was a long and bumpy road to get to where I am today, and the profusion of diet plans, books, and media hype didn't help. Evidence: an Amazon.com search of "diet books" came up with 25,000 hits. In this article, I cover today's most popular diet plans in light of the 2005 U.S. Department of Agriculture's revamping of the Food Pyramid that was originally introduced in 1992. I also look back on some past fads and follies. For those of you who just dropped down from another planet, "Atkins" refers to the diet guru Robert Atkins, MD. Atkins was the famous nutritionist who burst on the popular culture scene in 1972 with the publication of his book, Dr. Atkins' Diet Revolution. Atkins did indeed start a revolution. His book, which has since been read by over 30 million people, turned traditional knowledge about nutrition upside down. The Atkins' diet is largely high in protein and fats--despite strong evidence that animal fats can clog arteries--and very low in "carbs," the post-Atkins nickname for carbohydrates. This approach has earned him the epithet "apostle of protein gluttony." Atkins also makes little distinction among carbohydrates in his diet plan, recommending instead that you cut down considerably on all carbohydrates. This despite strong scientific evidence that many "good" carbohydrates (such as whole wheat, beans and vegetables) are rich in heart-healthy nutrients and protect against some cancers. Before we became "Atkinized," bread was called the "the staff of life" because of the high nutrient content of whole grains. During the Atkins craze, bread makers went into tailspin as bread sales plummeted and "breadless" sandwiches became de rigeur in certain circles. Food labels on many products bore "Atkins approved" labels, kicking other products off the market. Many critics believe that although weight loss will likely occur on the Atkins diet because the plan is generally low in calories, and blood levels of triglycerides may decrease due to limited carbohydrates, the diet is nutritionally unbalanced. It is too low in fruits and vegetables, and does not teach good eating habits. Among its dangers are that it is too high in saturated fat and may cause constipation. Even Dr. Atkins' death in April 2003 was embroiled in controversy. His family refused to authorize an autopsy, and the true cause of death is uncertain. However some say it wasn't really the result of a "fall on the ice"--the official cause--but that it was due to a heart attack, and that he had hypertension and weighed 258 pounds when he died. There is documented evidence that Dr. Atkins did have a heart attack in April 2002. If Dr. Atkins followed his own diet this does not bode well for the diet's future, and its popularity appears to be waning. There are hundreds of diet plans, but only a few have proven the test of time. Among the most popular are the long-running Weight Watchers plan, the South Beach Diet, the Zone diet, and more recently, the GI index. The Weight Watchers program was recently part of a review of ten of the nation's most popular weight-loss programs (among the others were Jenny Craig, Overeaters Anonymous, and Optifast). The review, which appeared in January's Annals of Internal Medicine, found that only Weight Watchers had documented evidence of its effectiveness in getting off weight and keeping it off. The Weight Watchers plan distinguishes between good and bad carbohydrates and fats, and is based essentially on sound health principles. One study showed that in six months, participants in Weight Watchers programs lost about 5% (or about 10 pounds) of their initial weight in six months and had kept off about half of it two years later. The authors added that the lack of scientific evidence of the other plans should not be viewed as discrediting them, but rather as a plea for further studies. They also said that some of the other plans might be appropriate for severely overweight people who need aggressive weight loss. The South Beach Diet, number 51 on Amazon's list of best-selling books, sells about 267 books daily for a cost of almost $3,500 a day. The South Beach Diet was written by South Florida cardiologist Dr. Arthur Agatson. It is neither a low-fat nor a low-carbohydrate diet. Unlike Atkins, and true to the new Food Pyramid, it distinguishes between "good" carbs and "bad" carbs (sugar, white bread, etc.) and "good" and "bad" fats. Meals generally are more balanced and include both desserts and snacks. A review of the South Beach diet by Nutrition Action Healthletter in the article "Weighing the Diet Books," claims that although South Beach isn't perfect, it is the first time in a long time that one of the most popular weight-loss books recommends a healthy diet. I found both good and bad reviews of the Zone diet, an eating program popularized by several books (The Zone, Mastering the Zone, etc.) that began appearing about a decade ago, mostly written by Barry Sears. Sears's approach appears to follow in the Atkins tradition. One review of weight loss diet books conducted by the Colorado State University Cooperative Extension writes that the Zone diet promotes a diet higher in protein and lower in carbohydrates than recommended. Further, the review states, the diet is "based on half-truths, mixed messages and theories, not grounded in peer-reviewed research." There is nothing magical about the Zone diet, it says, it is just a very low-calorie diet. Another review by the Nutrition Action Newsletter claims that it has the correct ratio of carbs to protein to fat (40:30:30) which promotes weight loss (and health) because it keeps insulin levels in the "Zone." The Dean Ornish diet (as described in his 1993 book Eat More, Weigh Less), is a vegetarian diet that is low in fat and high in complex carbohydrates. Ornish does not limit amounts of food (or calories) and encourages moderate exercise. The Colorado State University review calls the Ornish diet "heart healthy," but writes that non-vegetarians may find it difficult to follow. The Physicians Committee for Responsible Medicine (PCRM) also recommends The McDougall Program for Maximum Weight Loss by John McDougall, M.D. 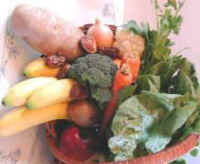 The McDougall program as described in his book is a low-fat vegetarian diet that is high in fiber and low in cholesterol. There is also massive evidence that saturated fat and cholesterol, found largely in animal products, are bad for you. A Canadian study, in this year's American Journal of Clinical Nutrition, found that a diet rich in fiber and vegetables lowered cholesterol just as much as taking the standard cholesterol-lowering drugs (statins). The newest approach to weight loss is diets utilizing the Glycemic Index (GI). This classification system uses the fact that high-glycemic carbs (such as refined flours) are quickly digested while low-glycemic carbs--such as whole grains--are digested more slowly. The system rates foods, selecting lower GI foods as "good" and foods with higher GI as unhealthy or "bad." Last year 175 new products were marketed as "low glycemic." Although the new Food Pyramid does not use the GI terminology, it encourages eating carbohydrates that fall into the slow-carb category. According to a Mayo Clinic review of the book The G.I. (Glycemic-Index) Diet by Rick Gallop, the foods emphasized are generally healthy, but not simply for the reasons stated. The review adds that a person may lose weight on this diet, but the weight loss is more likely due to eating fewer calories rather than the effects of low-glycemic-index foods. On the other hand, according to Grant Ferrier, editor of Nutrition Business Journal, the detailed Glycemic Index has better science behind it than most low-carb diets. • Oleic acid, the main component of olive oil, may protect women from developing breast cancer. • The Mediterranean diet helps fend off gallstones in men. • Physically active non-smokers on the Mediterranean diet have a 23% lower risk of death from all causes, including coronary hart disease and cancer. Eating nutrient- and fiber-rich carbohydrates, such as vegetables and whole grains. • Exercise should be an important element of a healthful eating plan. Even Weight Watchers now includes exercise as part of its program.